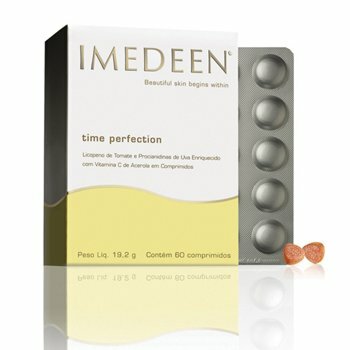 According to new research, staying youthful for longer could be within your reach thanks to a daily vitamin pill – Imedeen’s Time Perfection. Lots of the most beautiful celebrities already credit their perfect skin to Imedeen’s Time Perfection youth pills including models Naomi Campbell, Helena Christensen and Laura Bailey, actress Jessica Biel and Danni Minogue. And women looking for an anti-ageing solution don’t have to take their word for it, a new study conducted in Brazil has revealed that daily use of the supplements can help slow down the ageing process by as much as 48%. The study, undertaken by Brazilian cosmetic dermatologist, Dr. Adilson Costa – head of the Dermatology Department, Pontifical Catholic University of Campinas in São Paolo – followed a test group of women taking the daily pill aged between 35 and 60 over a period of 12 months. The results revealed a 30% reduction in fine lines and a similar decrease in wrinkles. Radiance and smoothness were also boosted by a huge 42%. Ingredients in the Time Perfection supplement include a mega dose of anti-oxidant vitamin C, zinc and a substance called lycopene, which is extracted from the skin of tomatoes. The latter was the subject of a study by L’Oreal a few years ago, which found that it had a marked effect on ageing. A-list fans such as Jessica Biel have talked of their love for the supplements in the past, which they describe as the reason for their preternaturally youthful skin. The new Mrs. Timberlake revealed that she believes skin is a ‘reflection of your inner health’ in a recent interview with website, Yahoo. Jessica Biel is famed for her glowing complexion and credits a combination of facials, skincare and supplements for keeping it in good shape. “Your skin is a reflection of your inner health, so I try to eat well, stay hydrated and get regular exercise,” she explained. Model Naomi Campbell also spoke of her faith in Imedeen’s anti-ageing prowess. “My beauty secret [is that] I use Creme de la Mer and I take Imedeen so my skin always has an air of good health,” she revealed. Meanwhile, 42-year-old supermodel Helena Christensen has admitted to using another beauty pill in preparation for time on the beach. Imedeen’s Tan Optimizer pill is part of the brand’s anti-ageing range and helps protect skin from sun damage. “I tan easily and as everyone, I wish to preserve my suntan as long as possible,” said the Danish model.